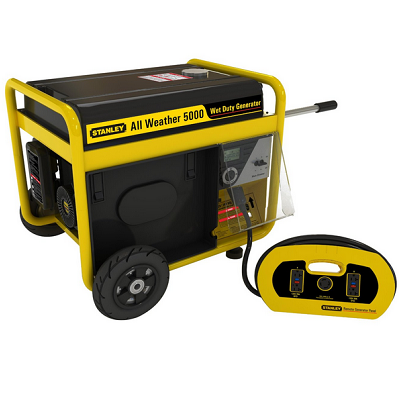 This all weather gas powered Stanley G5000S generator is portable and great for camping sites and at home during power outages. It comes with a 270cc 10hp OHV engine. It has various features that make this a good choice for any homeowner. This product costs about $760 online at Amazon. A heavy-duty 15 feet 10 gauge cord is also included. It also comes with a two year limited warranty. This machine runs on 5,000 watts continuous and 6,000 watts surge. It has four 120 volts GFCI (Ground Fault Circuit Interrupter) outlets. This is unique in that it has a large fuel tank for the output and will run 24 hours on a 12-gallon tank at 50-percent load. 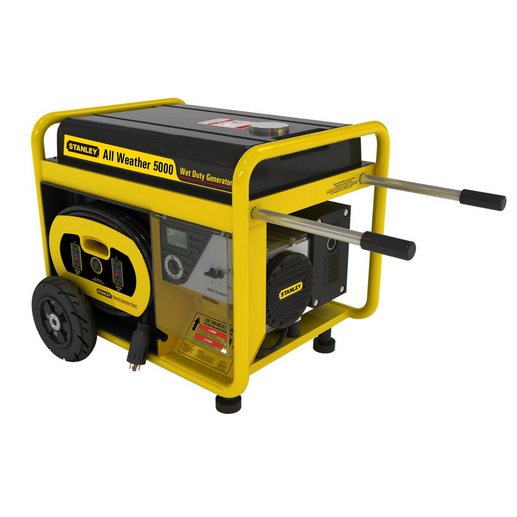 The automatic low oil shut down protects the engine and the life of the generator. An additional feature is the removable control panel so you can run this for the comfort of somewhere dry inside during poor weather. Other features include never go flat tires, so you know you can easily move this power equipment whenever you need to. Retractable handle bars make it easy to store. This product is recommended for its ability to power up large appliances in the home and power tools, safely and reliably in the wettest weather.